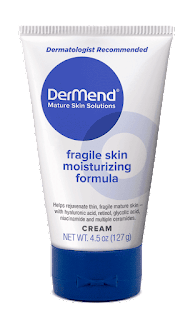 DerMend Fragile Skin Moisturizing Formula is for mature skin. As our skin matures, it loses its elasticity. Many factors, including sun damage, the loss of elastin and collagen help break the skin's surface down. Also, the protective fatty layer of tissue depletes, making skin thinner and more fragile than ever before. This can cause skin to tear easily and cause it to appear wrinkled or crepey, especially areas that have been exposed to the elements more frequently than others. What DerMend does is it provides targeted care to help restore thin, fragile skin with rejuvenating ingredients and enriching moisturizers. For the best results, use twice daily or as directed by a physician to rejuvenate and help restore fragile, mature skin. Using DerMend twice daily helps to improve the appearance of thin, fragile skin and helps maintain a more youthful appearance. It contains the following anti-aging ingredients: hyaluronic acid, retinol, glycolic acid, niacinamide (Vitamin B5) and multiple ceramides. Because it does contain an alpha hydroxy acid, it might make your skin more sensitive to the sun. It is important to wear a sunscreen during the day when using this cream. Actually, to decrease aging of the skin, it is very important to wear a sunscreen during the day to decreast aging of the skin. This product is patent pending. I found this cream to be very rich, but it sinks into the skin immediately. It moisturizes very well (as it should) and makes the skin feel soft and supple. I used it during the night because I found that using this and a sunscreen during the day was too heavy. I have normal skin and it can get a little oily during the summer. So this is a better moisturizer for me to use during the winter. Although I am not "mature", I would definitely use this as it is a great anti-aging moisturizer. It has all the right ingredients in it to be a wonderful anti-aging moisturizer. 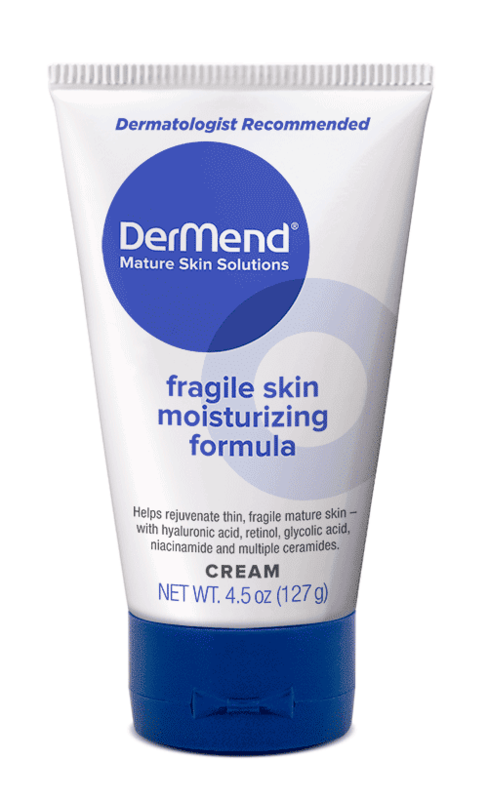 DerMend Fragile Skin Moisturizing Formula is available at CVS, Walgreens, Rite-Aid, WalMart and Meijer. It's also available online at www.amazon.com. If you go online to www.dermend.com you can get a $3.00 coupon for a purchase of this product. The price quoted above is for the price at Amazon.